Comment: Here is a rare example of strongest color paired with an excellent star. Such color is not often found in stars and with no gray but only a sheen of silver to make a strong star. See backside images: This gem actually stands on his back (that is how symmetric and balanced it is - a rare sight with often egg-shaped and uneven stars). In tungsten light it is very ruby-like while in cold daylight it tends more to purple. See images without star for the middle hues. 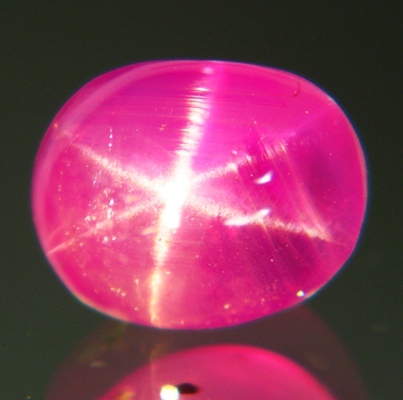 Close to transparent with no inclusions inside the gem (only the lower surface shows some minor dents). 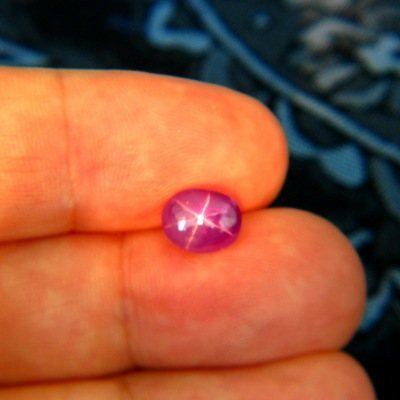 The best reddish purple star sapphire we have seen in a long while.